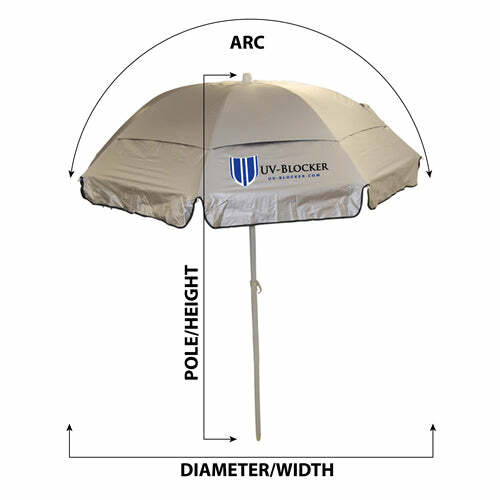 What is the difference between the UV-Blocker Personal Beach and the Large Beach Umbrella? The UV Protection Personal Beach Umbrella has a sleek, patented, and portable design will protect you from sun damage (UPF 55+), wind, and heat. Enjoy the sand and surf in safety and comfort with your portable beach umbrella! The UV Protection Large Beach UV Umbrella has the same features and the personal size but the canopy is a larger 7.5-foot canopy and has increased the strength and durability of the fiberglass ribs and pole. Plus comes with a heavy duty 21" anchor that can us used in the sand or dirt. Patented double canopy design with vented mesh system for optimum ventilation and stability lets the wind pass between the upper and lower canopies, keeping you 15 degrees cooler. Our UV-Blocker UV Beach umbrella is ESSENTIAL for beach-loving melanoma fighters! Its sleek, patented, and portable design will protect you from sun damage (UPF 55+), wind, and heat. Enjoy the sand and surf in safety and comfort with your portable beach umbrella! For more information about Sun Umbrellas click here. This UV Protection Personal Beach Umbrella is in stock and ready to ship next business day. This UV-Blocker UV Protection Personal Beach Umbrella has been approved by the Melanoma International Foundation to help protect you from the harmful UV rays. If the UV-Blocker UV Protection Personal Beach Umbrella is not the best sun protection umbrella you ever owned, simply return within 30 days and receive a full refund. We live in FL, so it was about 85-degrees with full sun when we tried it on the patio as a trial when it arrived, and it worked perfectly. It did feel cooler under the umbrella, and the 10-mph breeze did nothing to make it flinch. Opening and closing hardware uses big, durable plastic parts that are super easy to open and close - no struggling or pinching fingers to get it open or closed. The ribs are strong, with no flex or bending. The umbrella material is soft and a bit stretchy feeling, but strong. Since the material isn't canvas, it's LIGHTWEIGHT, even with the bottom pole attached. Grandma or your little kid can carry it, no problem. 100% HAPPY. The UV Protection Personal Beach Umbrella worked beautifully. It was roomy enough for two, light but sturdy, and easy to set up. I got the anchor accessory which kept it in place in a windy day. Couldn't be happier with this beach umbrella and the excellent protection in provided. Top notch serious beach umbrella. May not be pretty but very functional. My third purchase. Highly recommend. I go to Cape May Point, NJ beaches. It has been a windy summer with 15mph winds. As I watched other umbrellas tumble down the beach, I noticed the umbrellas the beach tag checkers use didn't budge. I asked what kind of umbrella they used & then researched it online. A bit pricey to me at first but now I would say worth every penny. I am on the beach for 8 hrs sometimes, I do wear spf but have not gotten a sunburn all summer. It is way cooler under the umbrella also. The plastic anchor I purchased in addition to the umbrella does not hold up to the winds. I would pass on that. Just learn to dig the bottom portion of the pole about half way into the sand. These should be sold in stores. Also, customer service is great! What is the difference between the Compact, Travel and the Large Folding UV Umbrellas? The Compact UV umbrella has a smaller handle and folds down to a smaller size and is meant for occasional use. The Travel UV umbrella has a larger more comfortable handle and stronger frame. The Large Folding UV umbrella has a larger more comfortable handle, heavy duty frame and can cover two people.